Unitronics has released UniLogic version 1.18. This version introduces features and enhancements that extend the application reach of UniStream, Unitronics’ One HMI + PLC controller. SQL Connectivity: UniLogic enables programmers to build SQL Queries and execute them via Ladder functions, including data transfer data between UniStream’s Data Tables and remote SQL databases. HMI Screens to Web Page: A mouse click converts existing HMI Screens to Web Pages. 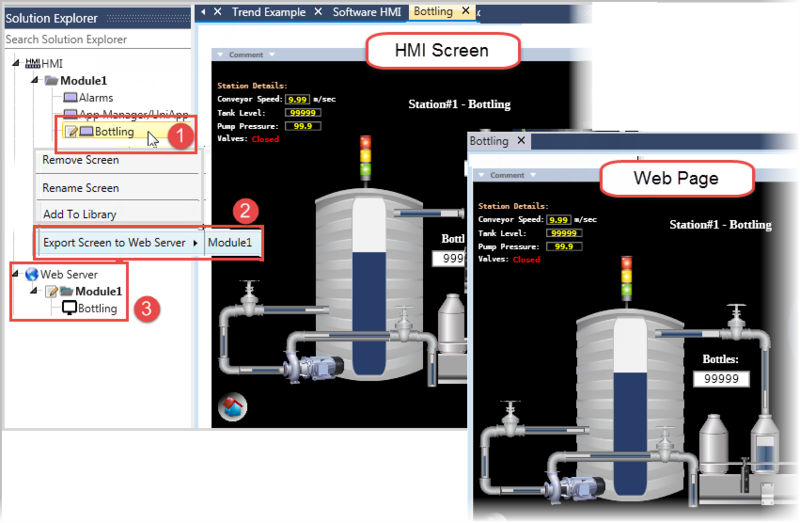 HMI Custom Controls: A programmer can create an HMI Custom Control, and then drag and drop it from the Solution Explorer, export/import it between projects as .uluce files, or add it to the Library. Programmers can also define tags that are local to a specific Custom Control; local tags are exported/imported along with the control. Other features include an HMI email Configuration Widget, the ability to edit email accounts via UniApps as well as UniApps interface translations for Russian, Polish, and Chinese. UniLogic 1.18.370 contains a number of additional features and enhancements. Unitronics (R”G) Ltd. is an Israeli company with international presence that has been producing PLCs, automation software and accessory devices since 1989. Unitronics’ products combine full-function PLCs and HMI operating panels into single, compact units. These HMI + PLC devices are programmed in a single, user-friendly environment. For more information, visit Unitronics website www.unitronics.com.